In the years following its publication, F. A. Hayek's pioneering work on business cycles was regarded as an important challenge to what was later known as Keynesian macroeconomics. Today, as debates rage on over the monetary origins of the current economic and financial crisis, economists are once again paying heed to Hayek's thoughts on the repercussions of excessive central bank interventions. The latest editions in the University of Chicago Press's ongoing series The Collected Works of F. A. Hayek, these volumes bring together Hayek's work on what causes periods of boom and bust in the economy. Moving away from the classical emphasis on equilibrium, Hayek demonstrates that business cycles are generated by the adaptation of the structure of production to changes in relative demand. Thus, when central banks artificially lower interest rates, the result is a misallocation of capital and the creation of asset bubbles and additional instability. 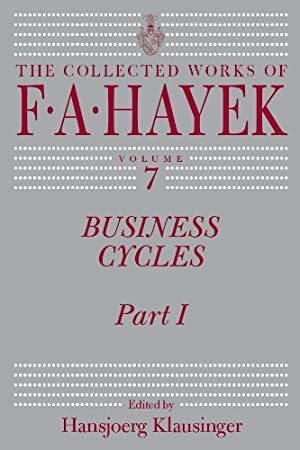 Business Cycles, Part I contains Hayek's two major monographs on the topic: Monetary Theory and the Trade Cycle and Prices and Production. Reproducing the text of the original 1933 translation of the former, this edition also draws on the original German, as well as more recent translations. For Prices and Production, a variorum edition is presented, incorporating the 1931 first edition and its 1935 revision. Business Cycles, Part II assembles a series of Hayek's shorter papers on the topic, ranging from the 1920s to 1981. In addition to bringing together Hayek's work on the evolution of business cycles, the two volumes of Business Cycles also include extensive introductions by Hansjoerg Klausinger, placing the writings in intellectual context -- including their reception and the theoretical debates to which they contributed -- and providing background on the evolution of Hayek's thought. Log In to track F. A. Hayek on eReaderIQ. to be notified each time the price drops on any book by F. A. Hayek. to stop tracking F. A. Hayek. Log In to track Hansjoerg Klausinger on eReaderIQ. to be notified each time the price drops on any book by Hansjoerg Klausinger. to stop tracking Hansjoerg Klausinger. We started tracking this book on May 31, 2013. This book was $12.54 when we started tracking it. The price of this book has changed 46 times in the past 2,155 days. The current price of this book is $50.39 last checked one day ago. The lowest price to date was $12.54 last reached on May 31, 2013. This book has been $12.54 one time since we started tracking it. The highest price to date was $63.00 last reached on February 28, 2019. This book has been $63.00 5 times since we started tracking it. We last verified the price of this book about one day ago. At that time, the price was $50.39. This price is subject to change. The price displayed on the Amazon.com website at the time of purchase is the price you will pay for this book. Please confirm the price before making any purchases.